Reduce your stress associated with media content production in three steps ! Automation of page layout saves time. Proofreading support function reduces errors. KUMI-WAZA is a powerful automated layout plug-in that was developed based on expert advice from media content designers. Not only for creating flyers, KUMI-WAZA can also be used for creating business cards, DM mailings, catalogs, menu, and many other media contents. Increase work speed and efficiency through automated layout,eliminating the need to input each component manually! Easy proofing of materials such as catalog since any difference between produced material and original data is clearly highlighted. Useful functions to assist in the layout adjustment or image replacement that improves modification work efficiency. Not only production efficiency, but operating cost can be reduced by enhanced accuracy! Not only the layout work, but are you having a hard time checking texts and images during the process? KUMI-WAZA will support your proofreading while providing automation of page layouts. KUMI-WAZA can save time and manpower, but furthermore, contributes to reducing the cost of operation errors and time loss. CSV File compatible! Importing data is easily done from editable Excel data. Modifications are easy! Eliminates time consuming copy/paste processes for original data! 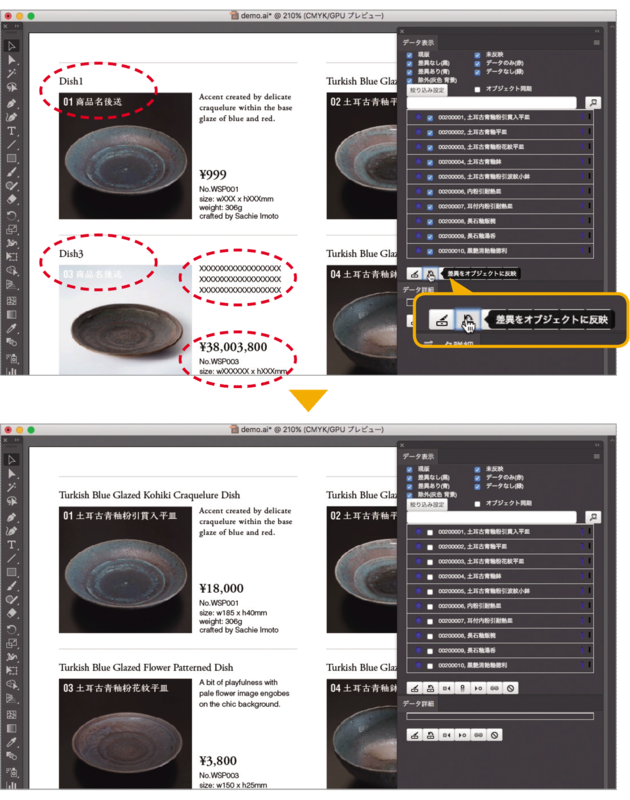 With KUMIWAZA automated layout, they can be automatically inserted with just one click! Greatly enhances work efficiencies. The software was developed based on designers’ input. 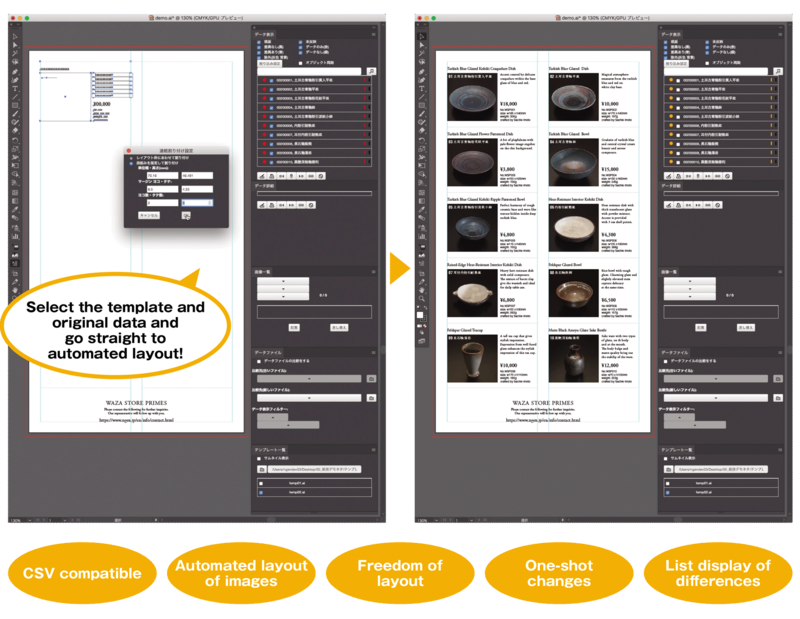 The solution offers many benefits of automated layout while maintaining a high degree of freedom for design work. Multiple images can be registered to a text data, eliminating extra work of searching for a replacement image. Just select and automated layout is done. Highlighting of differences in the text data and creating an index of differences will help your proofreading work. By linking to other WAZA series components, production material can be used for Web media without additional work. Production processes are this much different!! *They must be installed in the PC that is used. *OS requirement depends on each version of the Adobe Illustrator and InDesign. Other system configuration required for the operation depends on the system requirement of each application. *Adobe, Illustrator and InDesign are registered trademarks of Adobe Systems Incorporated in the United States and/or other countries. 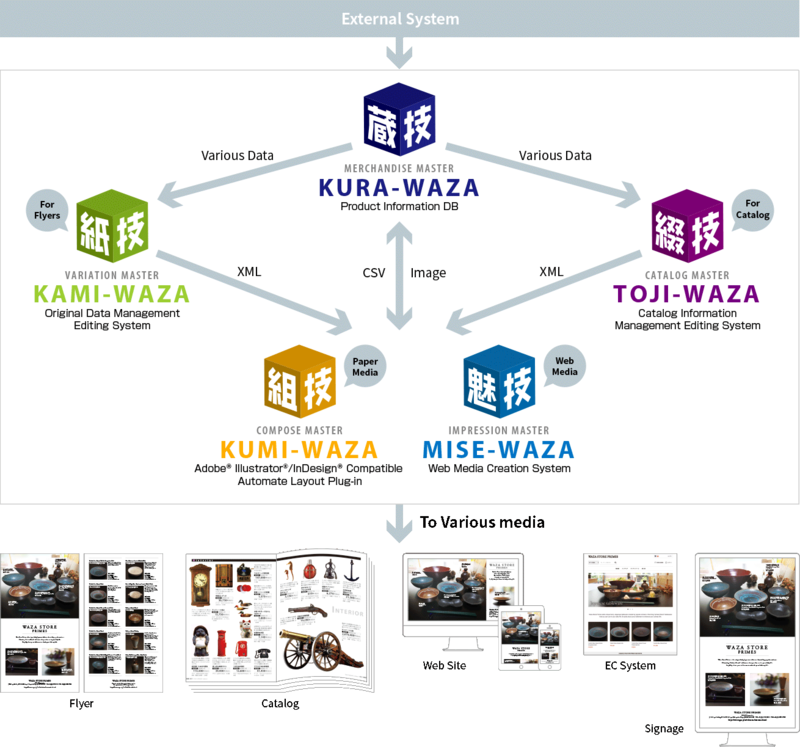 WAZA series for easy media management and production support.